If you have had a Cesarean section and are considering trying for a vaginal birth with your next pregnancy, there are a few essential things to ask your doctor about VBAC. VBAC, or vaginal birth after Cesarean section, is now being banned in some hospitals not due to the extreme risk of VBAC itself, but due to the legal risk of lawsuits if something goes wrong during the birth. Will the Doctor Attend a VBAC? Some physicians no longer attend VBACs, often citing the increased risk of uterine rupture as the reason they choose not to attend VBAC births, but others admit that the fear of a malpractice lawsuit governs their choice. It's important to note that the risk of uterine rupture exists for all women who have previously had a c-section. The New England Journal of Medicine published a study in 2001 that puts the rate of uterine rupture at 0.16 percent for women who had a repeat Cesarean section without going into labor. For women who went into labor without being induced, the rate of rupture was 0.52 percent, or 5.2 per 1000 births. Some doctors will not commit to a VBAC before the birth, but will agree to allow the pregnant woman a "trial of labor." This normally involves letting a woman go into labor on her own and closely monitoring both mom and baby for signs of problems or distress so that an emergency c-section can be quickly performed if the situation requires it. Whether or not your physician will attend the delivery is one of the things to ask your doctor about VBAC. Does the Hospital Allow a VBAC? The American College of Obstetricians and Gynecologists (ACOG) reaffirmed its guidelines for VBAC deliveries in 2004. ACOG recommends that hospitals that allow VBAC deliveries have a surgical team, including an anesthesiologist, on site and available at all times. For large metropolitan hospitals, this may not be a problem, but for hospitals in small towns or rural areas, this may be a logistical and financial impossibility. Hospitals have also been less willing to allow VBAC deliveries because of the danger of lawsuits. Judgments against a hospital can run into the millions of dollars and could potentially bankrupt a smaller facility. While it is sad that a legitimate medical option has been eliminated from some hospital maternity departments, the current legal climate has made it necessary for hospitals to reduce as much of their legal risk as possible. What About Prior Medical History? For some women, a vaginal birth after a cesarean is not a safe option. 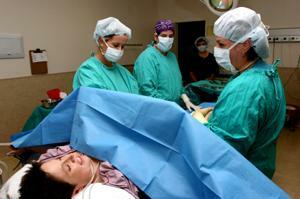 In a Cesarean delivery, the baby is delivered through a surgical incision in both the abdomen and the uterus. The surgical incision used to open the uterus may be oriented differently. Abdominal incisions are generally made very low, and this type is referred to as a low transverse incision. The incision on the uterus may be a low transverse or it may be a low vertical incision, which starts low in the pelvis and runs toward the navel. There is a third type of incision called a "classical" or high vertical incision, and women who have this kind of incision run a higher risk of uterine rupture during labor and delivery. Asking about the type of uterine incision is one of the most important questions to ask your doctor about VBAC. VBAC is also more risky for women who have never had a vaginal birth or who have had more than one Cesarean before attempting a vaginal birth. If a woman's placenta is low-lying or completely over the opening of the cervix, attempting a vaginal delivery is not safe and could cause a hemorrhage that would be dangerous for both mother and baby. Also, if a baby is positioned feet down in the uterus or is lying sideways, a vaginal delivery could be potentially fatal for the baby. Each woman's body and health is different and no delivery option is necessarily best for all women. VBAC is one choice that some women have and every pregnant woman needs to weigh the risks and benefits of any decision she makes about her pregnancy and birth.